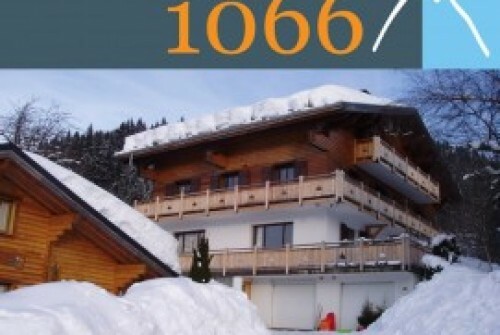 Wessex and Bayeux - 15% discount on available weeks through the ski season. Week of 12th to 19th January - 10% discount on all accommodation for full weeks where available. This picture was taken yesterday morning by Ben, the weather is wonderful – with crisp snow on the ground, a clear sky and beautiful clear mountain air. With temperatures of minus 20 degrees Celsius and deep snow for 4 to 5 months of the year, chalets in the Alps need taking care of to ensure they are in good condition for each ski season. Over last weekend, we collected our new vehicle - a Landrover Defender - from the main dealer in Gap and drove this to Les Gets. 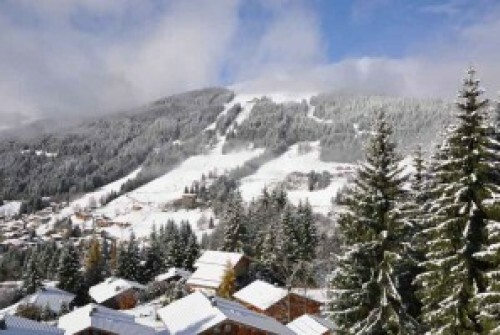 We will now be sure of getting around Les Gets in even the worst possible winter conditions. 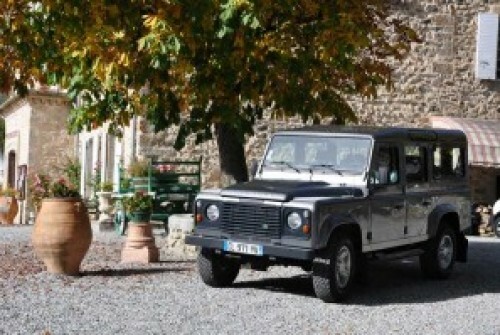 Collecting the Defender was quite a 'mission' – we left Maidenhead in the UK at 04.15 on Friday morning for Gatwick – we flew to Marseilles – as this is the closest airport to Gap – and then picked up a hire car. The weather in Marseilles was like a warm English summer day. We are having a lot of work carried out on the Hastings Chalet: Firstly, we are totally re-furbishing the staff apartment – our staff work hard for long hours – so it will be great for them to be able to return at the end of the day to a much more comfortable (and sound proofed) apartment, hopefully they will have even more energy to give our clients an excellent service. Les Gets in the summer is the place to relax and unwind whilst savouring the mountain views over a long coffee in the mountain top restaurants. There is plenty for everyone from the coffee lovers who enjoy walking from café to café on the mountain tops to the adrenalin junkie paragliders. 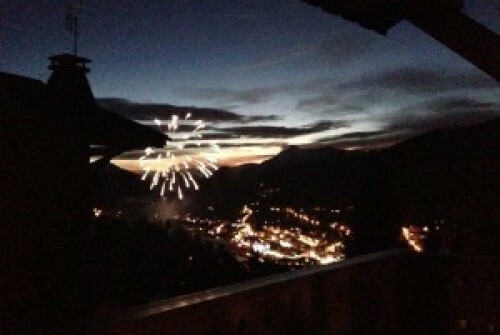 Don't forget the mountains in Les Gets in the summer months are awash with beauty. Savour the mountain air whilst walking between mountain cafes. Hastings itself is a 20 minute walk up to Les Pleney where you can enjoy coffee and cake overlooking the mountains towards Morzine, from there walk further up Les Chavannes, even all the way to the top, passing various cafes and restaurants along the route! These pictures were taken only yesterday in Avoriaz by Jeff and Laurie, this was their last day before returning to the UK, the lifts in Les Gets closed on Sunday yet in Avoriaz, their view was that the snow was almost as good as it was in January. Some are saying that the lifts could have stayed open longer this season. 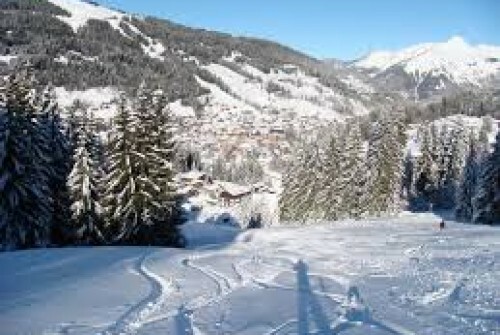 Today it is snowing heavily in Les Gets - Sue is due to leave on Saturday - let's hope she can get to the airport! They say that the Easter snow is poor - and you have to trek higher to do any skiing; well not so for us - we had a late start and saw the bright sun rising over the Chavannes mountain. We then took the regular Navette bus down into les Gets, bought a one day pass (adults at 20euros) and we were soon away skiing! Firstly up the Chavannes Express up to the top of the Chavannes area and then down to the Chavannes area several times. When we got braver we took the Violete run down to "the bowl" where the pistes were that little bit quieter and "off-Beat"! Quite frankly not having been able to afford skiing lessons over here as well as everything else (we learnt - well had had a few sessions - at Xscape MK) we kitted out, took the bus into Les Ges (there is a free bus which circles the town every 30 minutes) (as well as a train which circles the village too! ), and took the "Bubble lift" up to the Chavannes area. A typical holiday day for me at Chalet 1066 has started off with warm bread being delivered straight to the door. After we would get ready and walk to the bus stop which takes us down to the town, where we then get off and walk to the slopes. We will then get onto either the bubble lift or the chairlift which takes us up to where all the slopes are. Les Ges is a very comfortable place to ski especially if you are a beginner you can start off on the green slopes and then gradually onto the blue and then if you're feeling confident enough you can attempt the red. There are also the black runs but they are very difficult and are more for the advanced skiers and snowboarders!